There has been a great deal of anxiety surrounding the final list of competitors for speed skating in the upcoming Olympic Winter Games. I suppose, if we follow the AP style guide, the most important information should come first, so here it is: Sophie is in, the rest of the Aussie guys are not. What follows is an explanation of how this came to be. 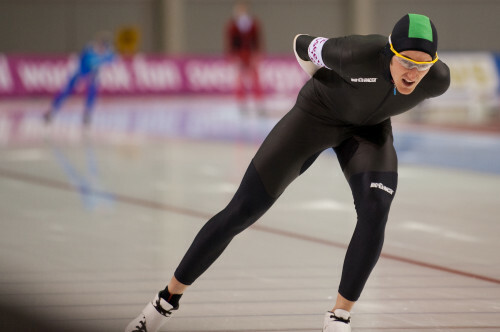 First of all, the sport of speed skating is governed by a body called the international skating union, or ISU, who are the umbrella organization for all forms of the disciplines of figure and speed skating on the ice. The ISU rules for qualifying for the olympics for speed skating changed quite recently, in June 2008 in fact. The reason for these changes was supposedly to help smaller countries get into the games, and to encourage better participation in the world cup events leading up to the games. Currently, the qualification is not particularly simple. There exists a two-tiered system of entry. For example, in the 500m, there are 40 places for the men (36 for the women). The first twenty are allocated according to the points rankings from the first five world cup events of the year. The twenty places after that are allocated by next-fastest times. In addition to all of this, skaters must achieve a time which is faster than the qualifying standard (for the men’s 500m for this olympics, it was 36 seconds). There are also a limited number of events in the season that are “official” enough for these times to be skated (world cups, regional qualifiers). There is a maximum number of four athletes per country per event. So, if a country were to somehow have ten skaters in a particular event fall within the top 40, then only four of them would be able to go. But which four? Not necessarily the four who qualify. There is a peculiar system whereby places are earned for each country, and the country’s own olympic committee then has the final say in who fills those places. They can theoretically send whomever they wish, although it is a requirement that any person sent must satisfy the qualifying time standard. This is a dilemma mostly suffered by larger skating countries who earn many quota places but have so many good skaters that they have a hard time deciding how to fill them. Many countries have come up with intricate systems to try and give advantage to those who earned the places in the world cups, but that is beyond the scope of this post, and may be covered briefly in my documentary. But wait, there’s more! There is a maximum TOTAL number of athletes that any individual country may send to the olympics. If your country has qualified at least one skater in every event, then your maximum is 10, if not, then it is 8. Furthermore, there exists an International Olympic Committee (IOC) quota for the total number of athletes who may be entered for speed skating at the olympic games. This number, along with the qualifying times, is usually released on the 1st of July in the year prior to the games. To understand what happens next requires a very careful reading of the ISU rules. Where did that leave us? Daniel and Ben were moved to the top of the reserve list for the 1000m and the 1500m respectively, and Josh was moved down from the last qualified place to the top of the reserve list for the 5000m because a certain Swiss skater by the name of Roger Schneider, although having a terrible season, had placed 12th in the 5000m at last year’s world single distance championships. Being at the top of the reserve list is not a bad place to be. After the provisional list is released, everyone goes into a process whereby countries then decided whether to use all of their quota allocation, and if so, who to fill those quota places with, then they submit those lists to the ISU after which the ISU publishes a new list and this process repeats for about 3 iterations. It is very common for at least a few countries not to fill their quotas, and that allows the reserve list to come in. The 17th of January is the final cutoff date for countries to send in their nominations of athletes, and the 28th of January was supposed to be the deadline for the ISU to release the final start list for the games. This year turned out to be slightly different. There was a great deal of controversy surrounding selections in many different countries, and on more than a few occasions there were many challenges, judgements, and appeals. At the end of the day, the list did not seem to change at all. The ISU were not very transparent about the whole process, and I have it on good authority that some countries withheld their athlete list and were trying to negotiate for more places.3 In addition, the IOC quota for the total number of athletes was 180, and the provisional list was already well over that number. So some would have to be culled further, and those would come from the men because there are slightly more quota spots for the mens events than the womens. Obviously, when the situation is at the stage where lists are being culled, the reserve list is no longer a part of the equation. At the end of the farce, and after a five day delay, despite being at the top of three very short lists, none of the guys made the final cut. Devastating doesn’t even begin to describe it, especially for Josh, who was our highest-ranked skater in a world cup in ANY event, who had actually qualified, only to be bumped out by an out-of-form skater (who wouldn’t have even made the reserve list this year) on a strange technicality. ALL I GOT TO SAY IS THAT JOSH PRETTY MUCH WAS SHAT ON AND HE SHOULD BE IN FOR THE 5K AND HE SHOULD HAVE RACED THE 1500 BECAUSE HE WAS THE FASTEST AND HE WOULD BE GOING TO THE GAMES!..